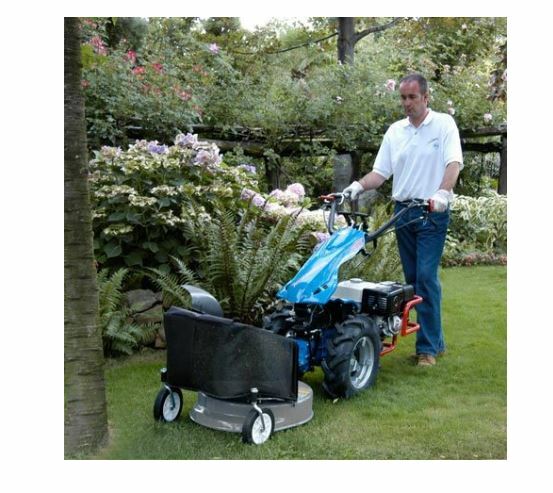 Save time, maintenance and storage space by making your BCS tractor a manicured lawn mower, too! The BCS Lawn Mower outperforms most walk-behind mowers in the market with a steel deck and heat-treated steel gears running in oil bath. 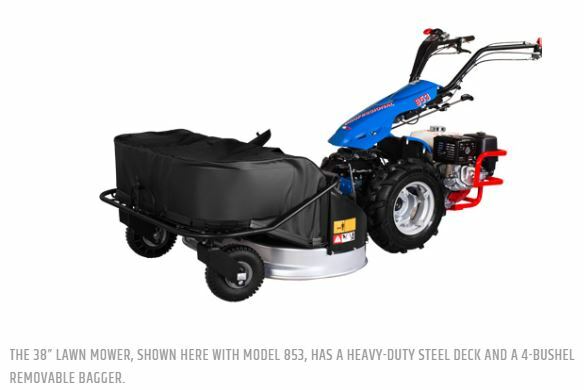 Both the 22” and 38” mower decks provide the option of side discharge or bagging. The bags can be easily removed, and the side discharge port is above the deck for a wider dispersion of the clippings. Effective bagging of the clippings requires proper air flow, and the key variable is the distance from the bottom rim of the deck to the ground. 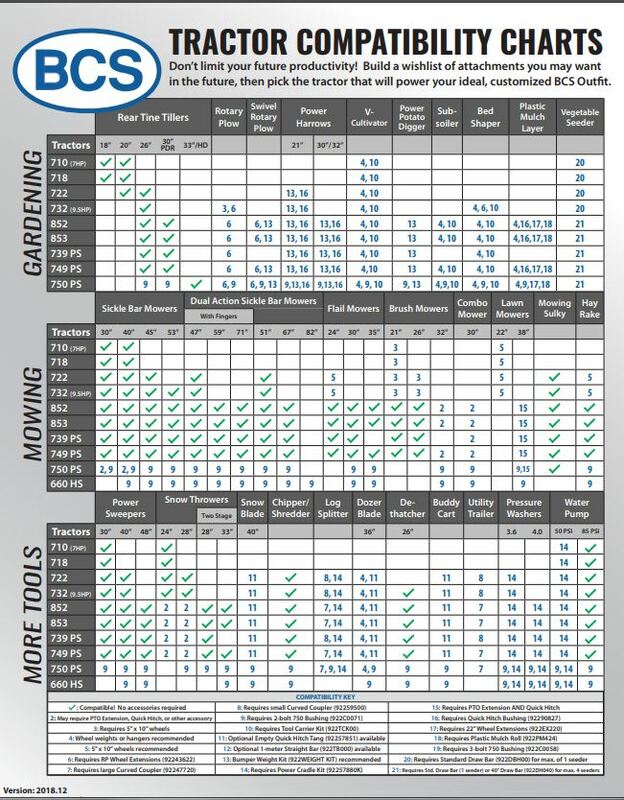 BCS Lawn Mowers have the unique system design of adjustable blade settings on splined, spindled shafts—without raising or lowering the deck. The height of the blades can be adjusted in seconds with a mounted lever, and maintains a premium cut and peak bagging performance with the desired air flow. Hinged blade tips on the 38” mower are used to protect it from impacts with rocks, stumps and other hard surfaces, and each blade has its own discharge into the bag, allowing the maximum amount of clippings into the bag as possible. The bags on both mowers are also hinged so that it pivots upward and forward for easy removal of the clippings. 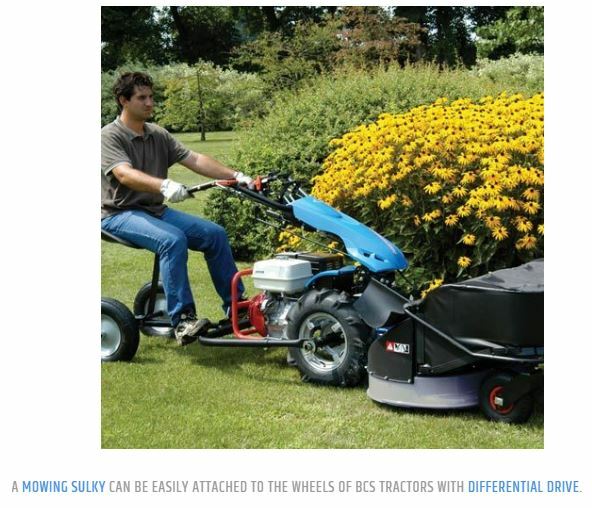 For the areas too large to mow while walking, check out the BCS Mowing Sulky, which allows owners to ride while they mow. Cutting height range is 2.5 to 4 inches on 38” mower; 1.5 to 2.5 inches on 22” mower. Heat-treated steel gears in oil bath. Unique top-mounted lever instantly adjusts the blade(s) for different heights. Easy front-dumping with top-mounted 4-bushel bag on 38″ models. 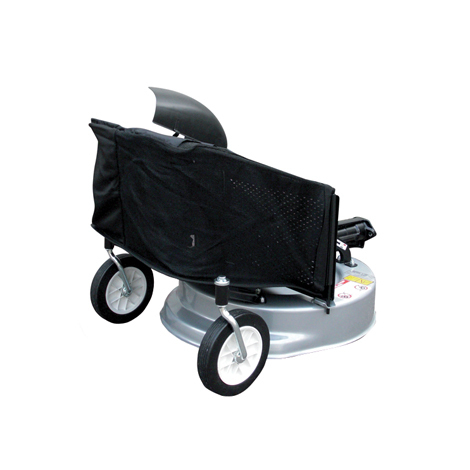 38″ deck floats side-to-side minimize scalping on uneven terrain. 22” Lawn Mower is 66 lbs; 38” Lawn Mower is 213 lbs.